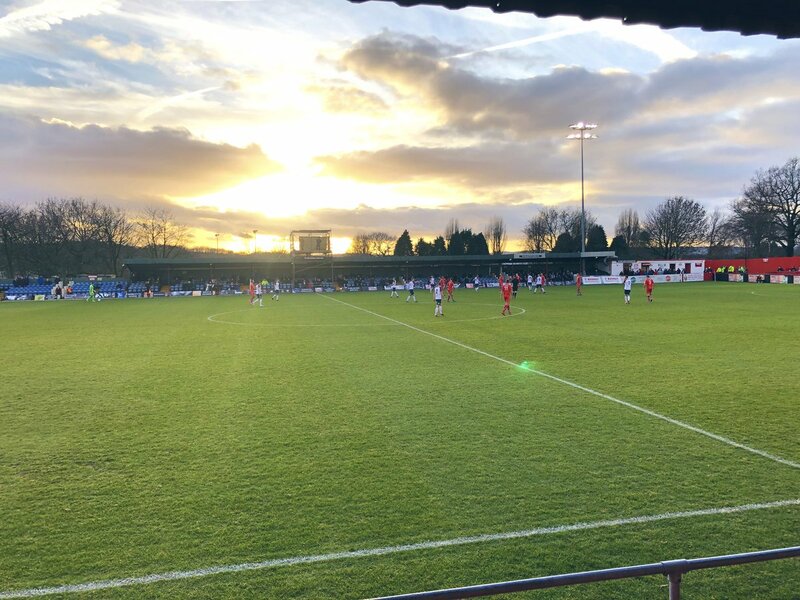 A vastly improved Alfreton Town battled to a draw against promotion pushing Stockport County as both sides produced a compelling contest at the Impact Arena on Saturday. Billy Heath had a close to fresh squad to choose from and saw returns for Josh Wilde, Adam Curry and Michael Collins. Jordan Sinnott returned to the bench. The game started at a very quick pace with the Hatters having a dominant opening five minutes, Stott had an acrobatic effor which went wide from a corner in front of the large away following at the Alma Street end. David Lynch had our first effort collecting Tom Allan's nod down but the midfielder's low effort was held well in the box by Hinchliffe. Duxbury rifled a free kick from 23 yards wide of Sam Ramsbottom's right hand post. Sam then produced a stunning save to tip wide Warburton's swerving effort which was destined for the top corner. The Reds responded with a neat move, James Clifton's long throw was cleared only as far as Collins who found Clifton before Wilde released the cross and Allan's header was held by the Hatters goalkeeper. Warburton hit a free kick into the wall as Alfreton defended solidly under Stockport pressure, Richard Peniket nearly found a connection with a low fast paced cross from Allan on the left. Turnbull then curled over the bar before a big chance went for the visitors as Thomas blasted over the bar unmarked in the box after a pull back on the left. Reece Styche fired over the bar before Wilde's wonderful lofted pass had to be cleared away in the boxas Alfreton continued to fire back on the attacking front. Styche raced forward again but his shot went wide of the left post. Allan was causing problems down the left wing and showed excellent quick feet to get out of a tight corner and into the box but the Hatters cleared the danger as both sides had their moments of dominance in the first half. The second half continued at the same pace as the first, Allan headed wide from Clifton's far post corner; Curtis Bateson's cross was well cleared before Peniket's cross in the box was also blocked as the Reds piled the pressure on. Allan would again have a good opening but headed over the bar again when well positioned. Styche's long ranger was briefly spilled by Hinchliffe before Luke Shiels reacted superbly at the other end to block Warburton's shot in the box after some quick interchanges from the Hatters. On 63 minutes Alfreton were awarded a penalty after a trip in the box, Clifton stepped up but could ony blast the penalty over the bar to the delight of the away support behind the goal. The game then got even crazier as the Reds were given another penalty just two minutes later for another trip in the box, this time on Allan. Styche stepped up this time to send the goalie the wrong way and give the Reds a deserved lead. We had our tails up at this moment and Styche went on an incredible run down the right, went past two before dribbling into the box and forcing Hinchliffe to tip his effort over the bar. The corner came to nothing before Allan fizzed a shot wide of the far corner inside the box. Alfreton continued to press and Peniket's shot was blocked before Bateson's run was denied on the right wing and went behind for a corner. The Reds corner was countered and we defended well to deny Duxbury twice getting an effort in on goal. But with 80 minutes gone former Red Nyal Bell timed his run well to half volley a finish following a cross from the right into the bottom corner past Ramsbottom in the box. Stockport pressed us hard towards the end of the game but we held on to secure what was an excellent point. There will be an element of frustration for the Reds at missed chances and not being able to build on the goal lead but the contest was an excellent one and a draw seemed the fair result. Alfreton looked back to their best and will be keen to build on the performance on Boxing Day as we travel to Boston United with a 3pm kick off. ATFCXI: Ramsbottom, Clifton, Wilde, Lynch, Curry (Hotte 51), Shiels, Styche (Platt 83), Collins, Peniket (Hobson 89), Bateson, Allan. Subs Not Used: Nicholson, Sinnott.